Save 40% off apparel, accessories & sleepwear + receive an extra 40% discount on clearance styles during Labor Day Sale at Lane Bryant stores in the U.S. and Lane Bryant online. This offer ends today (09/05/2016) but do not be sad, there is another offer which continues until September 29, 2016. 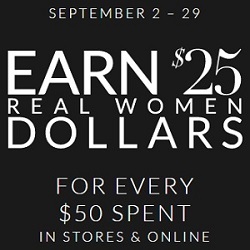 You can earn $25 Real Women Dollars for every $50 you spend (in-store & online). You can redeem your Real Women Dollars between September 30, 2016 and October 10, 2016, get more details how to redeem the Dollars at Lane Bryant online. Source of the information is Lane Bryant.